Ed Arbeau is the Pastor of New Life Church, Kingston Ontario. He has served in this capacity since 2003 when he moved to Kingston with his wife, Sonia, and their children, Kyle, Corey and Maryka. Ed is an inspiring preacher and teacher. Each week he delivers a message that is dynamic, positive and relatatable. Sonia is enthusiastically dedicated to the children of New Life Church and serves as Kidz Life Director. For more than 25 years, Ed and Sonia have been engaged in full-time ministry. After graduation from Bible College, Ed served as a short-term missionary to the country of Pakistan for approximately seven months, and in 2013, travelled to Ireland on two occasions, preaching and teaching the Word of God. 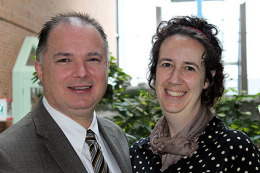 Since 1988, Ed and Sonia have served in various ministry capacities including children’s ministry, youth ministry, pastoring and church planting. The Arbeaus have preached dozens of revival meetings and evangelism seminars. To date, Ed and Sonia have taught more than 1500 Home Bible Studies, a vital area of their ministry. Ed also invests a great deal of time and energy into the training of young ministers of the gospel. Each year, for the past several years, Ed has served as a guest instructor at Northeast Christian College, Fredericton, NB. The Arbeaus continue to be a blessing, enriching the lives of people who come in contact with them and New Life Church in Kingston.